Three shells from a set for the kaiawase game. Three hundred and sixty half shells were distributed between the players in two teams. Each side played one half shell in turn and when a player matched one shell to another that player kept both halves. The game was popular amongst the ladies of the Imperial court in the Heian and Kamakura eras and the shells were often beautifully decorated - in this case with scenes from the Tale of Genji, the 11th century novel by Murasaki Shikibu, herself a lady of the court. 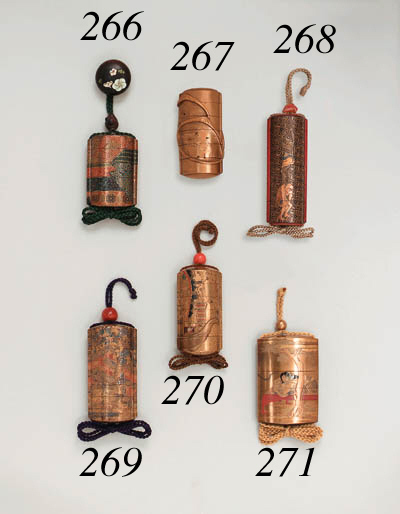 Because of the unique match of a pair of shells, they came to symbolise prospitious marriage and the pair of containers for a set was included in the wedding procession of a daimyo's bride to her husband's house.